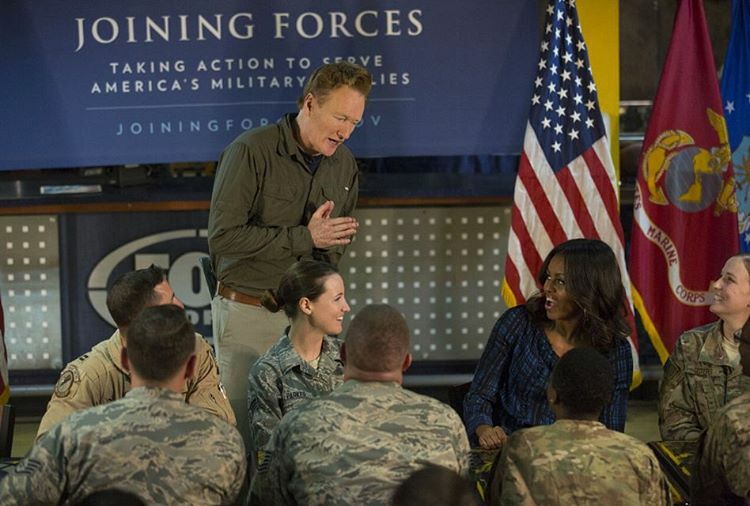 Funnyman Conan O’Brien and First Lady Michelle Obama put on a show for troops stationed at Al Udeid Air Base yesterday. And judging by this short clip of Conan’s stand-up set — apparently taken by someone in the crowd and sent to John Q. Public blogger Tony Carr, who posted it on his YouTube channel — he left the troops howling with laughter. In his gut-bustingly hilarious rant, Conan eviscerates the base’s restrictions on consuming alcohol and suggests a few tweaks to the military’s policy that seemed … let’s call it warmly received by the crowd. Portions of Conan’s trip will be shown on his TBS show later this year. Let’s hope the broadcast includes footage of Obama challenging O’Brien to drop and give her 50, as shown in this photo on the First Lady’s Instagram. The Air Force also said three dozen troops were chosen by their commanders to meet Obama, who also held an ice cream social with a few airmen and thanked troops for their service.